Hi! Today we will see about ajax inline editing using php and mysql. Inline editing allows users to rapidly modify web page contents in place without the requirement of forms. Popular sites like Facebook, Twitter, etc. employ this technique so that users can change their profile information without having to navigate through separate forms. Using HTML5's 'contenteditable' on page elements will take care of inline editing. For example, you can convert a plain html table into an editable table by setting 'contenteditable = true'. 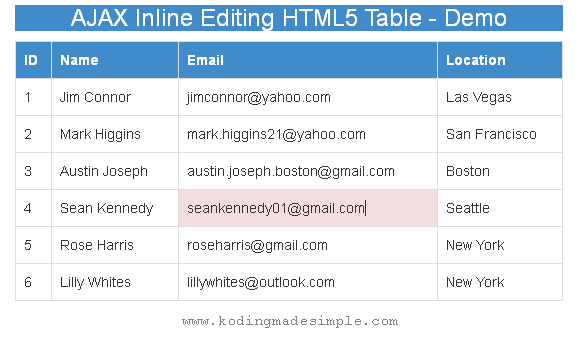 If you are new to inline editing, take a look at html5 editable table tutorial. The 'contenteditable' attribute can be used on almost all html elements, but the data edited by user is only temporary. It will be lost when the page is refreshed. Therefore, you must use ajax to send the data back to the server and store it in database for future use. Here, let's see a demo with editable html table listing records from mysql table. Each time the user makes some changes, the edited data will be sent to the server through an ajax call and will be updated in the database using php. During editing, the table cell will change to red background and to green when completed. savecustomer.php - PHP script to update database table. First we need a mysql database and table to use in our example. Run this below sql file on mysql. It will create a database, a table and add some sample records in it. Next, we must establish the connection to database. The following script will open a php-mysql connection. Next fetch records from the mysql table we have created in step-1. 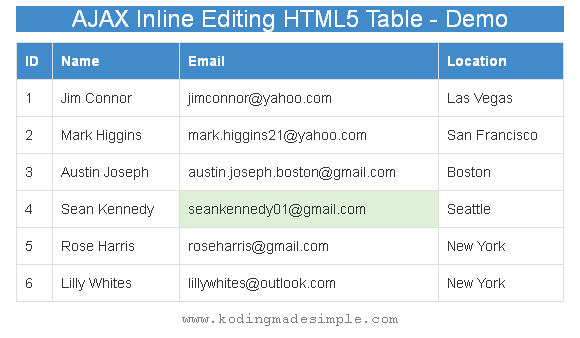 Then create an html5 table with inline editing enabled. And loop through the mysql resultset and display the records on the table one by one. In the above markup, we have added two event functions for each cell in the table. One is to change the background color on focus and the other is to submit edited cell data to the server on blur event. Next is the ajax function saveData(). This function will post the edited data, record id and column name to the server as a json string. Once the database update is complete, the background color of the <td> element will change to green. Following is the complete script for the index.php file. Finally, we need to store the data edited by the user on the database. Here is the php code to do it. Done! Now we have all the necessary files in place. Run index.php and you will see a nice table that lists the records from the database. Edit some table cells and the cell color will change to red during editing. Once you finish editing, the table cell turns green as soon as it lost focus. Refresh the page and the data you have modified will remain there. It means that we have saved the edited data on the database successfully. That explains about inline editing using php, mysql and ajax. Inline editing will enhance user experience and also save you from creating multiple web forms. You can apply the technique with any html element. I hope you like this tutorial. Please don't forget to share it on social media. Good day!! !